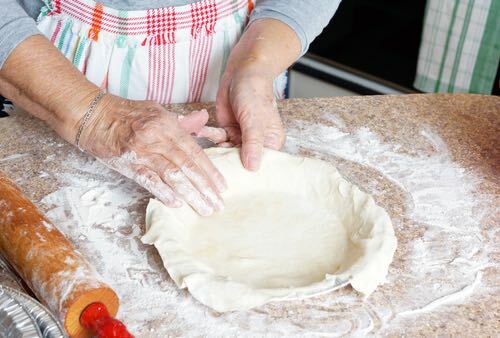 The easy pie crust recipes that Grandma used could always be counted on to make the best tasting pies, and they have served her family well for generations. Only the old fashioned recipes make pie shells the way they should be — light, flaky, and rich tasting. Crust that's so delicious. See which crust is your favorite. Making pie crusts from scratch does take extra time, but once you taste your homemade pie with its flaky old-style crust, you'll know those extra minutes were worth the extra effort. The taste of Mom's homemade pie crusts is one of the fondest food memories of my childhood. Her pastry was so rich and flaky that it fell apart when you lightly touched it with your fork. No store-bought pie shells can compare! For a good cream pie crust made without butter or lard, try this simple and never-failing pastry recipe: To 1 pint of sifted flour add 1 even teaspoon baking powder and sweet cream enough to moisten the flour to a dough just stiff enough to work. Roll out quickly and bake in a quick oven. This is enough for 2 pieces of single crust. Crush graham crackers and mix: 1-1/2 cups graham cracker crumbs, 1/3 cup powdered sugar, scant 1/2 cup butter. Pat mixture into 9-inch pie pan. Place pie pan in refrigerator. Allow to stand for several hours and then fill with lemon chiffon pie or any cream pie. 1 cup all-purpose flour, 1/2 teaspoon salt, 1/4 cup plus 2 tablespoons shortening. Sprinkle 2 to 3 tablespoons cold water into flour mixture, one tablespoon at a time, until moist enough to hold together. Press into pie plate. 2-3/4 cups flour, 1 teaspoon salt, 1/2 pound lard; plus 1/2 tablespoon vinegar, 1 egg, and enough water to make 1/2 cup. Cut into thin strips about 1 inch wide, sprinkle with butter, sugar, and cinnamon, roll up like jelly roll, and bake a light brown. Yummy. 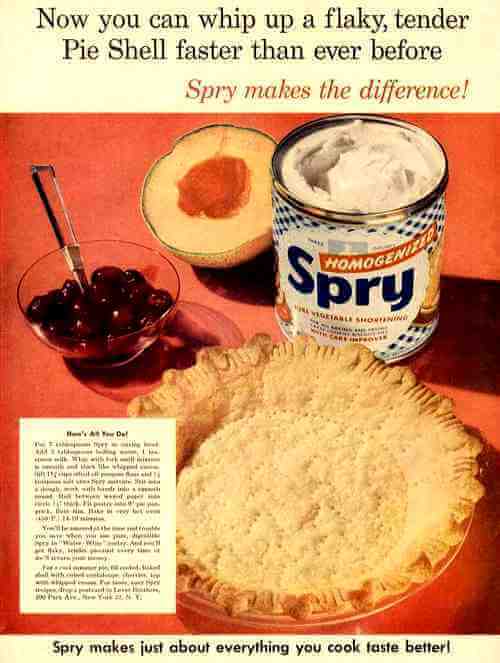 Shortening companies sometimes included easy pie crust recipes in their magazine ads to encourage the use of their product. Here's a good example. Put 7 tablespoons Spry (shortening) in mixing bowl. Add 3 tablespoons boiling water, 1 teaspoon milk. Whip with fork until mixture is smooth and thick like whipped cream. Sift 1-1/4 cups sifted all-purpose flour and 1/2 teaspoon salt onto Spry (shortening) mixture. Stir into a dough, work with hands until a smooth round. Roll between waxed paper into circle 1/8" thick. Fit pastry into 9" pie pan, prick, flute rim. Bake in very hot oven (450°F) 14-19 minutes. For a cool summer pie, fill cooled, baked shell with cubed cantaloupe, cherries; top with whipped cream. 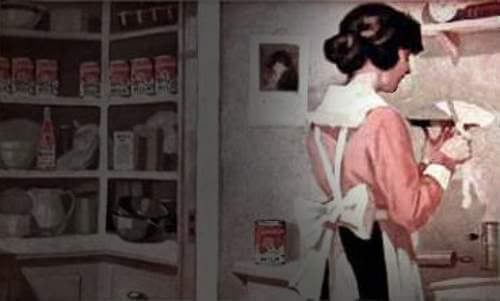 Two and a half cupfuls of sifted flour, one cupful of shortening (half butter and half lard cold), a pinch of salt, a heaping teaspoonful of baking powder sifted through the flour. Rub thoroughly the shortening into the flour. Mix together with half a teacupful of cold water, or enough to form a rather stiff dough; mix as little as possible, just enough to get it into shape to roll out; it must be handled very lightly. This rule is for two pies. When you have a little pastry left over do not throw it away; roll it thin, cut in small squares and bake. Just before tea put a spoonful of raspberry jelly on each square. 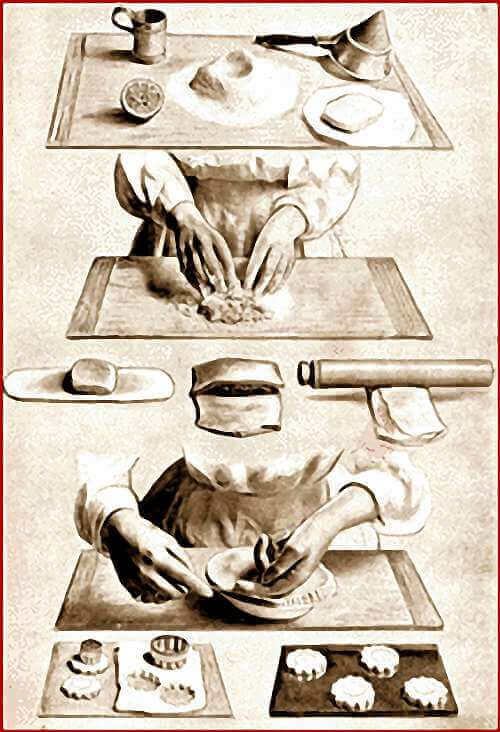 Refer to the illustration (below) that shows step-by-step how to make puff paste. You will be making quality puff pastry in no time! Put the flour onto the pasteboard; make a hole in the center, into which put the yolk of the egg, the lemon juice, and salt; mix the whole with cold water (this should be iced in the summer if convenient) into a soft, flexible paste with the right hand, and handle it as little as possible; then, roll out the paste; place the butter on this and fold the edges of the paste over, so as to hide it; roll it out again to the thickness of a quarter of an inch; fold over one third, over which again pass the rolling pin; then fold over the other third, thus forming a square; place it with the ends, top and bottom before you, shaking a little flour both under and over, and repeat the rolls and turns twice again as before. Flour a baking sheet, put the paste on this and let it remain on ice or in some cool place for half an hour; then roll twice more, turning it as before; place it again upon the ice for a quarter of an hour, give it two more rolls, making seven in all, and it is ready for use when required. A good crust recipe for a pie requiring only an under crust, as a custard or pumpkin pie, is: Three large tablespoons of flour sifted, rubbing into it a large tablespoonful of cold butter, or part butter and part lard, and a pinch of salt, mixing with cold water enough to form a smooth, stiff paste, and rolled quite thin. In making a pie, after you have rolled out your top crust, cut it about the right size, spread it over with butter, then shake sifted flour over the butter, enough to cover it well. Cut a slit in the middle, place it over the top of your pie, and fasten the edges as any pie. Now, take the pie on your left hand and a dipper of cold water in your right hand; tip the pie slanting a little, pour over the water sufficiently to rinse off the flour. Enough flour will stick to the butter to fry into the crust, to give it a fine, blistered, flaky look, which many cooks think is much better than rolling the butter into the crust. Ingredients: 8 oz of flour, 6 oz of butter (or equal quantities of butter and lard), 1/2 teaspoonful of lemon juice, pinch of salt, about 1/4 pint of water. Method: Sieve the flour onto a pasteboard, divide the butter into pieces about the size of a small walnut, and mix them lightly with the flour. Make a well in the center, put in the lemon juice, salt, and 1 tablespoonful of water, mix lightly, keeping the pieces of butter intact, and add water gradually until a moderately stiff paste is formed. Roll into a long strip, fold it equally in 3, turn it round so as to have the folded edges to the right and left, and roll out as before. Repeat until the paste has been rolled out 4 times, then use; or, if convenient, let it remain for 1 hour in a cool place before being used. Sufficient for making 1 pie of average size. 1 lb of fine flour, 8 ounces of castor sugar, 5 oz of butter, 3 eggs, the finely grated rind of lemon. Sieve the flour into a basin, make a well in the center, put in the sugar, butter, and eggs, and mix the whole into a stiff paste. Roll out and use as required. Have all the materials cold when making pastry. Handle as little as possible. Place in a bowl 3-1/2 cups flour, 3/4 teaspoonful salt, and 1 cup good, sweet lard. Cut through with a knife into quite small pieces and mix into a dough with a little less than a half cup of cold water. Use only enough water to make dough hold together. This should be done with a knife or tips of the fingers. The water should be poured on the flour and lard carefully, a small quantity at a time, and never twice at the same place. Be careful that the dough is not too moist. Press the dough with the hands into a lump, but do not knead. Take enough of the dough for one pie on the bake board, roll lightly, always in one direction, line greased pie tins with the rolled dough, and fill crust. If fruit pies, moisten the edge of the lower crust, cover with top crust, which has been rolled quite thin. A knife scraped across the top crust several times before placing over pie, causes the crust to have a rough, flaky, rich-looking surface when baked. Cut small vents in top crust to allow steam to escape. Pinch the edges of fruit pies well together to prevent syrup oozing out. If you wish a light, flaky pie crust, bake in a hot oven. If a sheet of paper placed in oven turns a delicate brown, then the oven is right for pies. The best of pastry will be a failure if dried slowly in a cool oven. When baking a crust for a tart to be filled after crust has been baked, always prick the crust with a fork before putting in oven to bake. This prevents the crust forming little blisters. 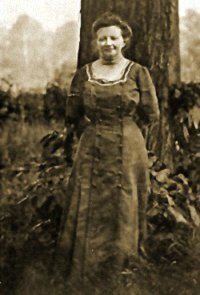 Aunt Sarah always used for her pies four even cups of flour, 1/4 teaspoonful baking powder, and one even cup of sweet, rich, homemade lard, a pinch of salt with just enough cold water to form a dough, and said her pies were rich enough for anyone. They certainly were rich and flaky, without being greasy, and she said, less shortening was necessary when baking powder was used. To cause her pies to have a golden brown color she brushed tops of pies with a mixture of egg and milk or milk and placed immediately in a hot oven. She frequently put small dabs of lard or butter on the dough used for top crust of pies before rolling crust the desired size when she wished them particularly rich. For superior pastry use 1-1/2 cups flour, 1 cup lard, 1/2 teaspoonful salt, and about 1/4 cup of cold water, or three scant tablespoonfuls. Put 1 cup of flour on the bake board, sprinkle salt over, chop 1/4 cup of sweet lard through the flour with a knife, until the pieces are about the size of a cherry. Moisten with about 1/4 cup of ice-cold water. Cut through the flour and lard with a knife, moistening a little of the mixture at a time, until you have a soft dough, easily handled. Roll out lightly the size of a tea plate. Take 1/3 of the lard remaining, put small dabs at different places on the dough (do not spread the lard over), then sprinkle over 1/3 of the remaining half cup of flour and roll the dough into a long, narrow roll, folding the opposite ends in the center of the roll. Roll out lightly (one way), then add lard and flour; roll and repeat the process until flour and lard have all been used. The pastry may be set aside in a cold place a short time before using. If particularly fine pastry is required, the dough might be rolled out once more, using small dabs of butter instead of lard, same quantity as was used of lard for one layer, then dredged thickly with flour and rolled over and over, and then ends folded together, when it should be ready to use. When wanted to line pie tins, cut pieces off one end of the roll of dough and roll out lightly. The layers should show plainly when cut, and the pastry should puff nicely in baking and be very rich, crisp, and flaky. When preparing crusts for custards, lemon meringues and pies having only one crust, cut narrow strips of pastry about half an inch wide, place around the upper edge or rim of crust and press the lower edge of the strip against the crust; make small cuts with a knife about 1/3 inch apart, all around the edge of this extra crust, to cause it to look flaky when baked. This makes a rich pie crust. A very good crust may be made by taking the same proportions as used for Superior Pastry (see above), placing 1-1/2 to 2 cups flour on the bake board, add salt, cut 1/2 cup lard through the flour, moistening with water. Roll out crust and line pie-tins or small patty pans for tarts. This pastry is not quite as fine and smooth as the other, but requires less time and trouble to make. Homemade lard made the old fashioned way is sweet, good lard, unlike today's store-bought lards that often contain partially hydrogenated oils. Nothing makes flaky pastry like good lard, so if you're planning on doing much pie crust making, rendering lard the way Grandma did might be your best option. In an article titled Praise the Lard you'll find illustrated, step-by-step instructions for rendering your own lard the easy, old fashioned way. The easy pie crust recipes will turn out perfect when made with pure lard that's been carefully rendered. Did you know that pies in the Middle Ages were baked in crusts called coffins, which were thicker than today's crusts and were often discarded after baking? By the end of the Elizabethan Era, thinner, lighter, more edible crusts made of short (butter) paste were being used and puff paste was being perfected. Today's pie crusts are very similar to the earlier short pastes. These old fashioned, easy pie crust recipes continue the fine tradition of homemade pie crust making. There's always a matchless satisfaction that comes from making pastry shells yourself.